Ever wonder why “America Runs on Dunkin’” is the slogan for Dunkin’ Donuts? Over 54 percent of Americans over the age of 18 drink coffee every day. We are a coffee culture, driven by all work and no sleep. Coffee wakes us up in the morning and keeps us going throughout the day. While there are some health benefits, like decreased risk of diabetes and certain types of cancer, there are a number of reasons to switch from coffee too. An equal, but better, alternative lies in tea. For one thing, coffee is addictive. The caffeine in it is a stimulant that speeds up your nervous and digestive systems. While it makes you feel awake, your body also builds a tolerance for it like it would any other drug. You need more and more to feel the same level of alertness over time. If you drink coffee every day, skipping even one day can bring upon a massive headache. This is due to increased blood flow and activity in the brain during withdrawal causing headache, fatigue and sluggishness. 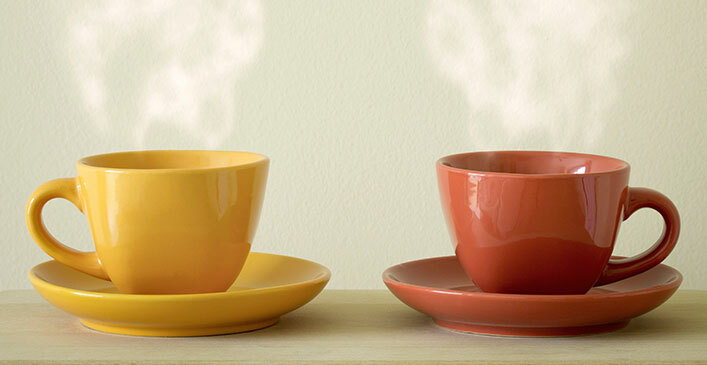 While many teas also contain caffeine, their levels are nowhere near coffee’s. The risk of addiction is also far less, although not nonexistent. Black teas have the most caffeine; averaging 60 – 90 mg compared to coffee’s 150 – 200 mg. Tea still has the ability to wake you up, but without the negative side effects that come with coffee consumption. Aside from the risk of withdrawal symptoms, coffee’s side effects can be rather unpleasant for some. Because caffeine is a stimulant, it increases your heart rate and can cause palpitations and jitteriness. It can also cause insomnia and anxiety, especially if consumed later in the day or evening. Additionally, because coffee is a mild diuretic, it can cause more frequent urination and loose bowels. This can be dangerous if other fluids or foods are not consumed during the day. During illness or excessive exercise, too much coffee can therefore cause dehydration. The five main types of teas are black, green, white, oolong and pu-erh. There are many other types of teas and very few side effects for most. The benefits far outweigh any negative effects. Black tea has the most side effects and can be similar to coffee, although on a much milder scale. The daily-recommended amount is no more than six cups per day, compared to one to two cups for coffee. Compared to coffee, tea is much better for your health in general. Green and black teas have high amounts of antioxidants, which help fight diseases like cancer and heart disease. Herbal teas can also speed up recovery from illnesses like the common cold, relieve nausea, and even help prevent insomnia. Regular tea drinkers also have healthier livers according to a Chinese study earlier this year. Additionally, green teas have been known to help with weight loss by boosting metabolism and breaking down fats in the body. While most people drink coffee to wake up, the reasons for drinking tea vary because there are so many varieties. Black teas with a lot of caffeine can be used to wake up, but there are also herbal teas like chamomile or valerian, which can help you relax and fall asleep. Detox teas help cleanse the liver and kidneys and may contain a combination of herbs and spices, like dandelion and burdock roots. Lemon and ginger teas aid digestion and upset stomach, while mint tea can help with constipation. There is a tea out there for almost every common ailment whereas coffee is mainly used for its varying levels of stimulation. Additionally, tea has a history of association with meditation and mindfulness in Asian countries. Japanese and Chinese Buddhist tea ceremonies focus complete attention on the preparation and consumption of the tea, invoking a state of Zen in the process. Drinking tea promotes a state of relaxation and concentration that coffee cannot compete with. It is an intimate activity and one that allows internal reflection while watching the tea leaves brew, pouring a cup, watching the steam swirl, and tasting the tea itself. Since there are so many varieties of tea, there are obviously many flavors as well. Tearooms have sprung up across the United States where tastings are held, much like there are with wine. Teas are paired with chocolate, scones, and finger sandwiches that bring out the flavor of both based on their combination. More than just a tea party, these tearooms and tastings are elegant affairs, which take place in upscale hotels in addition to private reservation-only storefronts. As with anything, moderation is key in the consumption of coffee or tea. The more you drink per day, the less likely you are to reap the benefits of either. Unless instructed to do so by your doctor for health reasons, eliminating coffee from your diet altogether is not necessary. However, the introduction of teas, especially herbal teas, should be done so under a doctor’s supervision. Teas used for health benefits are like any other supplement, and may not be regulated by the FDA. Consult with your doctor to ensure there won’t be any harmful interactions with medication or amplified symptoms due to consumption of certain teas.